Lemonade on crack. 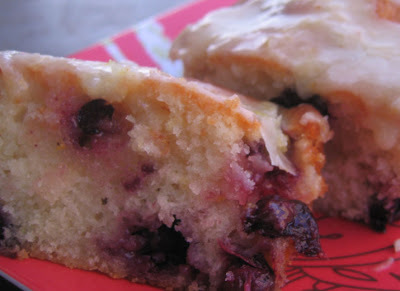 That's the best way to describe this Lemon Blueberry Bread. It's moist, delicious and lemony. I've used this bread as a dessert and a breakfast bread, it's that good. I'll admit, this recipe does have more steps than a basic banana or zucchini, but it's worth it. The key notes here are to line the bottom of your pan with parchment paper and also spray the pan. The blueberries tend to get stuck to the sides and bottom so you need to really plan ahead or you will end up a loaf that looks like a crew of mice attacked it. Make this bread today; it freezes quite well so do make extra and you can have a fork full of lemonade at a moments notice. Prepare to pucker up, you're fat and happy! Line the bottom of loaf pans with parchment paper and grease the pans as well (the blueberries will have a tendency to stick to the bottom). Fill the pans 3/4 full, bake for about 1 hour or until an inserted toothpick comes out clean. Cool the loafs for 10 minutes and then remove from pans. Place on a cookie rack with parchment under. 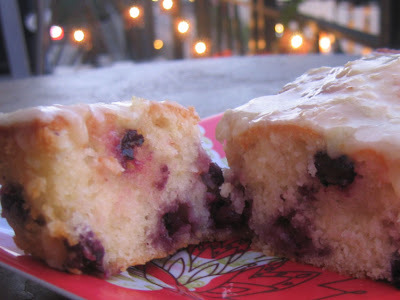 Pour the icing over the top (recipe below)- try not to eat the icing with by the spoonfuls! Make the icing right as the loafs come out of the oven. Melt butter over low heat, whisk all ingredients together until all lumps are gone.